My English 111 classes recently read Alice Walker’s “Beauty: When the Other Dancer Is the Self,” which revolves around an eye injury a young Walker received at the hands of her brother. As a result her eye is a “. . . glob of whitish scar tissue, a hideous cataract . . .” (Kirszner and Mandell 36). The scar in question inevitably results in Walker’s self-loathing until her two-year-old daughter inspects the eye with childish wonder and reveals to Walker, “‘Mommy, there’s a world in your eye'” (40). 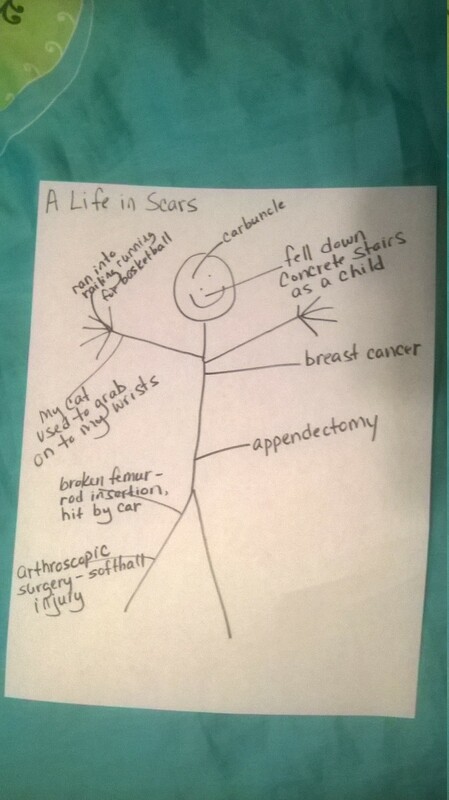 So, for the purposes of this Writing Workshop Wednesdays, I want YOU, the writer, to tell YOUR Life in Scars either visually as in the picture or in the below comments section. In eighth grade I broke both of my arms playing basketball. I have sprained both of my ankles also resulting from basketball. My sister scared the horse I was riding when I was little and I received and concussion and some badly scraped knees. When I was three, my tonsils were taken out because they swelled so much that it was affecting my breathing. Last year I swallowed a pill that did not go down all the way. It released in my throat causing a throat ulcer. I also broke my nose during a basketball practice. Out of everything I have been through, nothing hurts worse than having your ears pierced.